After a few days off, unsettled weather returned on Thursday, bringing some folks over three inches of rain. Others saw nothing at all, but everyone is likely in line to see at least some rain over the next couple days. Radar isn’t too active this morning with a few scattered showers — mostly light or occasionally moderate rain. As we go into the rest of today, look for scattered downpours and thunderstorms to blossom from later this morning into this afternoon. Like yesterday, we could see locally heavy rainfall in the most persistent storms. 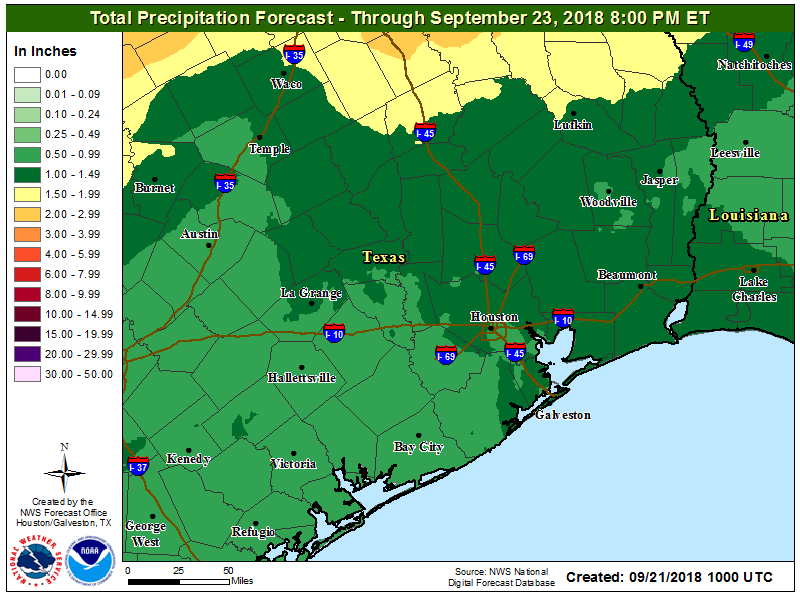 Rain amounts will again vary wildly, with some folks seeing little to no rain, while others could see two to four inches in a relatively short time, along with some localized street flooding. Unfortunately, the specifics surrounding the forecast this weekend are going to be difficult to lay out. If you’ve lived in Southeast Texas for any length of time, you know that our rain often follows a pattern of feast or famine: Neighborhoods that get soaked may be adjacent to dry neighborhoods. Trying to predict where and when it’s going to rain this weekend is impossible to do more than a few hours in advance, but we know that both Saturday and Sunday carry high chances that it will rain for a period of time during the morning or afternoon hours. Total rainfall should add up to about an inch to two inches on average across the region by Sunday evening. Some folks will see less than that. Others may see three, four, or five inches of rain or even a little more with some street flooding. If you have outdoor plans this weekend, include an umbrella and an indoor backup if possible. Where the heaviest ultimately falls will depend on how far south a cold front can push, along with other small-scale processes in the atmosphere. If there’s good news in all this, it’s that our six day string of 90°+ weather should end. We’ll see high temperatures in the mid-80s, with lows in the mid-70s. Yes, it will be unpleasantly humid, but at least it won’t be obscenely hot for later September. There are two questions I am anticipating we see rev up over the next week from our readers. 1.) Is hurricane season over for us? And 2.) When is autumn weather coming? Starting with the second question, you’ve seen Eric write or either of us tweet about this potential cold front later next week. Before we get there, we’ve got several more days of warm, muggy, and unsettled weather to get through. The forecast from Monday through Wednesday looks pretty similar each day right now. Expect clouds and some sun, with scattered to numerous showers and thunderstorms each day, beginning near the coast in the morning and spreading inland during the afternoon. We will do mid- to upper-80s for highs and mid-70s for lows. 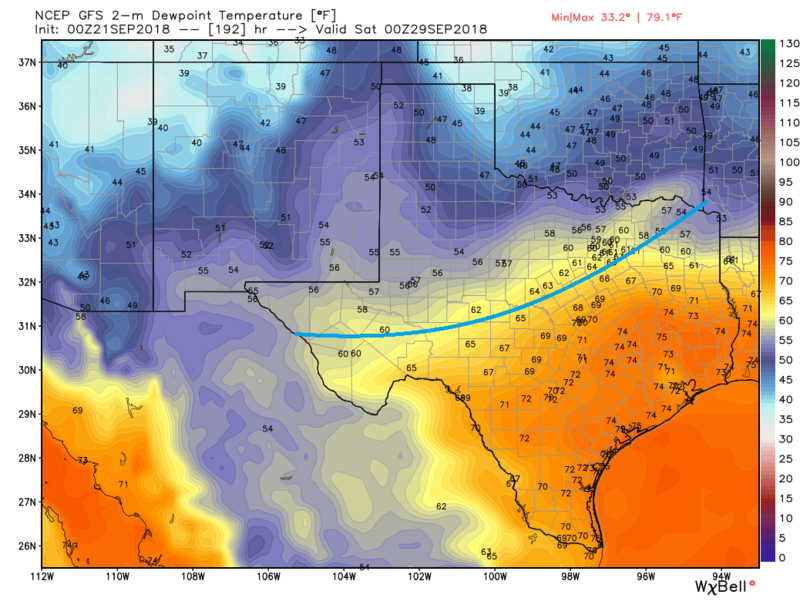 Models suggest the front is going to get hung up in Oklahoma or North Texas next week, keeping us warm and humid with unsettled weather in South Texas. I do still think we will get a front through here soon, but we may have wait another few days for a chance around October 2nd. Patience is required this time of year. Eric touched briefly on the tropics yesterday, and not much has changed today. For our purposes, it remains quiet. Across the Atlantic it’s beginning to shows signs of becoming more active again, but none of these systems pose any credible risk to us and the ceiling on how strong these systems become looks pretty low at this time. The main thing Eric and I will be monitoring is in the Caribbean. If we look at the modeling, it’s generally showing an increasing risk that something tries to develop in the southwest Caribbean in a little less than two weeks. That’s a climatologically favored area for tropical development in October. Usually, systems develop there and lift north toward Florida or the Bahamas. In this case, we don’t see any reason to think that won’t be what ends up happening. But, of course, if you’ll recall Hurricane Nate last October formed in that area and ultimately moved ashore in Mississippi, which is a little further west than usual. 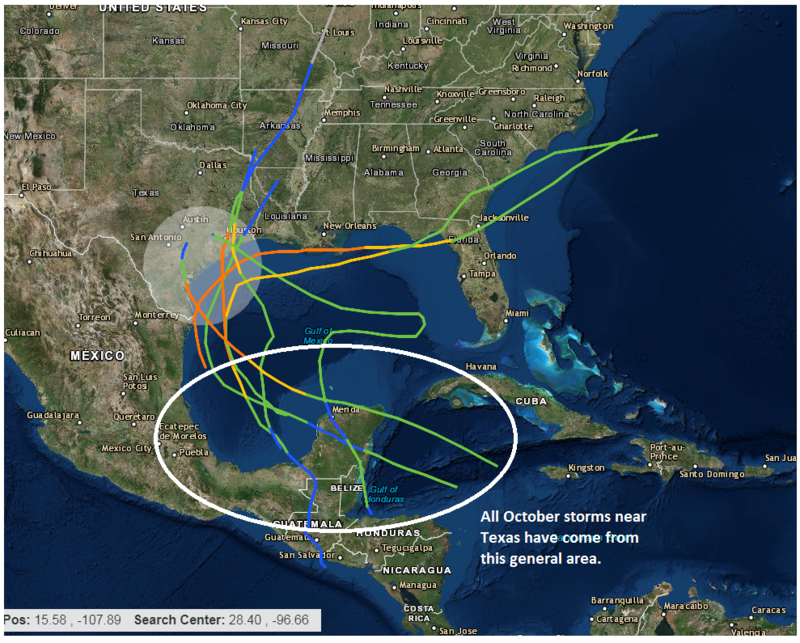 A quick history lesson: Texas has had seven tropical systems make landfall or pass nearby in October since the 1850s. That’s not many. The last was Hurricane Jerry in 1989. Prior to that, we had gone 50 years without one in October. But they’ve all originated in that general southwest Caribbean or Central America area. So while no reliable weather model shows anything of concern for us at this point, we’re keeping a passing glance on it, just to be safe. 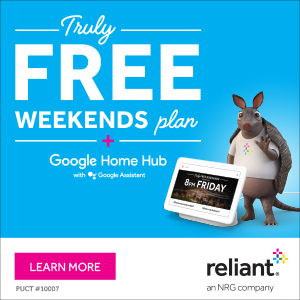 We’re very close to the finish line for our hurricane season in Texas, so we just want to make sure there are no last second stumbles. Space City Weather – The “real” Farmer’s Almanac. Hi Matt! I am usually weary of traveling in August/September timeframe. We usually try to go somewhere in October before the day-light savings time ends. We are planning a trip in the middle of October (October 14th and on). 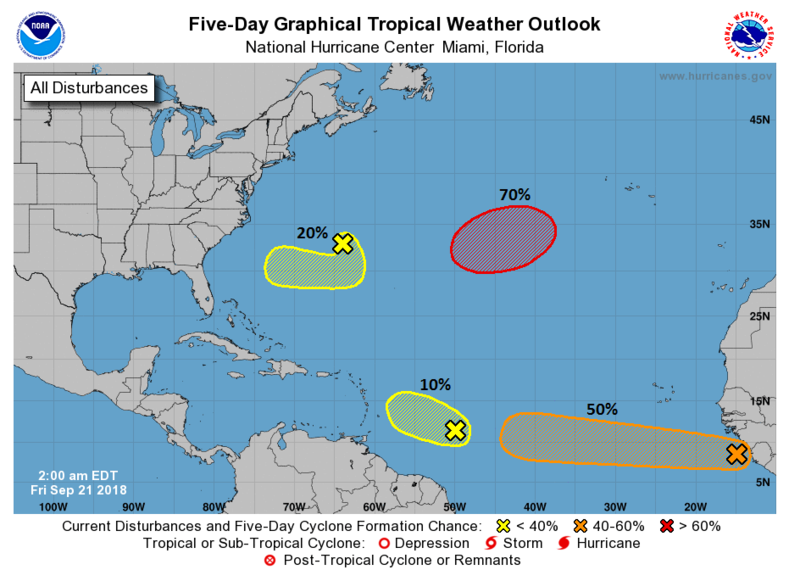 Do you think we will be out of the hurricane season by then? Just trying to gage probability for a storm. I also do not recall such a rainy September and I have been in Houston for 21 years. Thank you for everything you do for us! Hi there! Tough to say whether or not we’ll be out of hurricane season in the Caribbean/East Coast. But usually by October 14th, you’re definitely on the decline (there’s a second peak in hurricane activity that occurs by mid-October historically). I do wonder if this year will shut down after about the 10th. That’s my hope at least. So I certainly wouldn’t worry at this point about anything, but keep tabs on it! Hows it looking for UH stadium tomorrow evening? Can’t rule out some storms unfortunately, but, yes, as Grant notes from the article, not much else I can tell you at this point. Ok I too am hoping for good game weather, but seriously just read the article. I don’t know why so many people don’t understand this. They seem to expect Eric and Matt to know if it is going to rain on their patio at 3:51 PM or not. I remember Jerry in 1989, a small category 1 that barely affected the northern suburbs. But I was young and dumb enough to deliberately go down to Galveston to witness it. It was a direct hit on Galveston. I went to the seawall and ended up in a hotel lobby as things got intense, waves crashing over the wall and flooding Seawall Blvd. I saw a white van spun around and flipped over by the wind. I was scared to death. Bad idea to go hurricane watching. I was living in League City at the time, they eye came right over my house. Northern eye wall knocked down a section of fence. What do you consider the “Finish Line”? How close are we? The finish line for us would be when we can start getting cold fronts with some degree of regularity. If our first one truly is around October 2nd like some modeling hints at, that would go a long way toward making Eric and I feel good about us being just about ready to cross the finish. Historically, after September 24th or so, our risk drops off pretty dramatically (though as noted, it isn’t zero). One of those storms in the graphic looks like it started in the Pacific south of El Salvador and crossed into the Gulf. How uncommon is that? I think it’s less uncommon than you think based on what I know. I feel like I see a weird Pacific to Atlantic handoff every 5-10 years or so. Not necessarily via an organized system like that, but same sort of concept. It can work the other way too. So maybe “uncommon,” but not necessarily “rare,” if we want to have a semantics discussion ha. Of course, I don’t have the data in front of me to back myself up right now. Your forecasts are balm for a nervous heart during this season. Thank you for your hype-free approach. The Austin weather reporters are all over the place for their weather this weekend. Any help is appreciated on what you all are seeing for the UT game from 2:30-4:30? Fall never quite comes to Houston, just this gross fetid swampy air that cools a bit.